Every soft gel capsule of Omega 3 Fish oil by Herbioticum includes 1000 mg of fish oil. This fish oil contains high concentration of EPA (Eicosapentaenoic acid) and DHA (Docosahexaenoic acid). The recommended dosage for Omega 3 Fish Oil by Herbioticum is a single capsule to be taken once a day with a meal. Omega 3 Fish Oil by Herbioticum cannot be bought over the internet, but is available from a network of independent sellers. The product source has not provided any kind of information regarding the price of the product, but there is a phone number for contacting the company, which is based in Europe. The product website has a web form that can be used to send the product vendor queries and comments. Information regarding any guarantees or return policies for this product was unavailable. 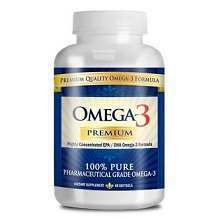 The product source did not give indication that customers who find Omega 3 Fish Oil unsatisfactory could get a refund. Omega 3 Fish Oil by Herbioticum contains a high concentration of Omega-3 fatty acids. These essential fatty acids provide a lot of health benefits, so the product is beneficial as a dietary supplement. Information regarding the dosage and ingredients has also been made available. However, it is concerning that the product source has not given any information about the price of the product. This makes it difficult for prospective customers to compare prices or make a decision on whether to buy or not. The fact that it cannot be ordered over the internet is also an inconvenience, considering how most other supplements can be bought online. Potential buyers have to search for independent local dealers who stock the product. The contact number given is for the company offices which are based all the way in Europe. Omega 3 Fish Oil does not come with a guarantee, and there is no return policy. Unsatisfied customers have no way of getting a refund or replacement product.